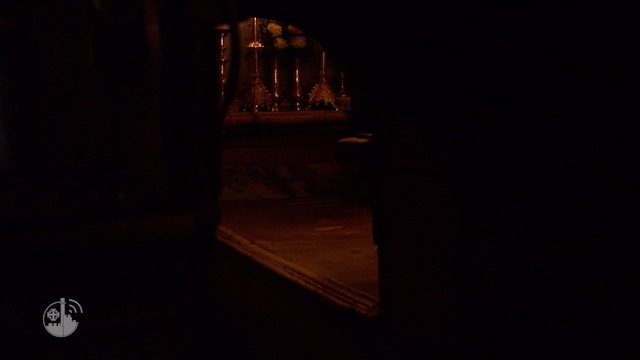 home / Multimedia / The Holy Land in news / “We are lambs among wolves”: The witness of Fr. ..
“We are lambs among wolves. Literally. Every evening we entrust our life to the Lord before sleeping, because we are very worried. Yet the next morning we wake up and see that our prayers have been fulfilled … In the same way we feel the power of your prayers for us. The Lord does not fulfill our prayers by making wolves disappear, they are still there, but they are also incredibly meek. We faced some persecution: they forced us to remove all the Christian symbols and we can not express our faith publicly; they threaten us, send their kids to throw stones at the doors of our houses and churches, but we are safe and are able to continue to live our daily lives with commitment, hope and faith “. The voice of Fr. Hanna Jallouf on the phone is clear, full of that hope he is telling us about; a hope, he says, that “overcomes all the abuses and violence we suffer every day“. 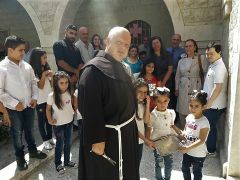 Father Hanna is a Franciscan friar of the Custody of the Holy Land, one of only two religious men remaining with the Christian communities of Knayeh and Yacoubieh in the province of Idlib, where about 30,000 fighters opposing to the Bashar Al Assad government, have taken refuge. In recent months there had been much talking about Idlib, the last stronghold of the Jihadists ruled by Jahbat Al-Nusra; initially there seemed to be no other solution for the Russian government and allies, except to invade the area causing civilian carnage, but then there was an agreement between Russia and Turkey, for the demilitarization of the area and the withdrawal of all fighters; at that point it seemed that the governments had reached a shared decision and all the media stopped talking about it. But the issue is far from the end, the province of Idlib is still under Al-Nusra and the conditions in which Father Hanna lives – toghether with Fr. Luai Bsharat and the communities of Knayehe and Yacoubie – are precarious. In this area ATS pro Terra Sancta continues the to support the communities through the distribution of food parcels and basic necessities and by offering hospitality at the convent to some homeless families. These activities are “a fundamental help” Father Hanna tells us, “The local Christian community would no longer exist without us and without your support it. That’s why we stay, people are in great need and constantly look at us in search of hope“. We want keep on supporting Fr. Hanna and the communities of Knayeh and Yacoubieh!